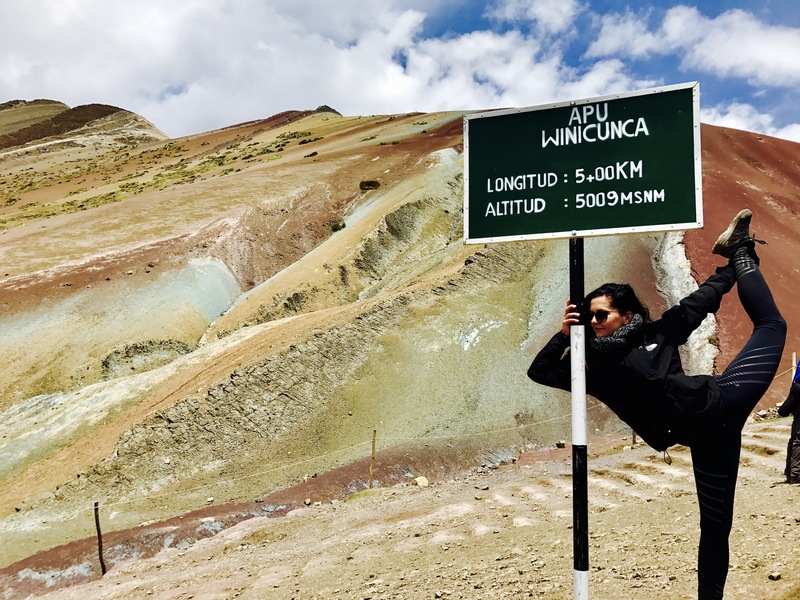 October 19, 2017 flyingyogisjLeave a Comment on Rainbow Mountain Peru – All You Need To Know! Rainbow Mountain Peru – All You Need To Know! With no rest for the wicked. As soon as we arrived back in Cusco from our 5 day Machu Picchu trek we were booking to depart for Rainbow Mountain( Vinicunca) the following morning at 4AM. Deciding one final push on our already tired bodies would be worth it to once again see for ourselves images we had been consuming over social media. The hike here is only two hours but the altitude is the highest of the trip. The route starts at 4400m and ends 5200! There were people passing on horses and some even vomiting from the sickness. I think the only communication me and charlotte exchange on the way was a couple of swear words, few shakes of the head and many looks of desperation! That is however, what makes this hike one of the most rewarding challenges I have done. I pushed and pushed until I reached the top. I was freezing cold, the wind blowing sleet and snow around in my face. Only to look up and be surrounded once more by views that’s will stick with me forever. Rainbow mountain gets its name due to the many minerals that are housed within it. Giving the mountain Its distinct Range of colours. The descent was the worse part, my fingers were numb, my body tense from the cold and my head feeling all kinds of nausea from the hike. I was a girl with a one track mind on getting to our mini bus and hopefully getting warm. Unfortunately it held little refuge for me so I made the conscious decision to fall asleep cause I couldn’t bare being awake and witnessing my reality anymore!! Go prepared! This trip isn’t for the faint hearted and due to the altitude it gets pretty cold up top. Hat, gloves, scarf, jacket were all needed for us! take change – toilets and hot coca tea is available on route! Walk at a steady pace and drink water – small sips but often.